Touched with humor and warmth, the homecoming was everything that Bishop Christopher J. Coyne could have hoped for when he entered SS. Peter and Paul Cathedral in Indianapolis to celebrate Sunday Mass on June 11. The cathedral was a familiar setting for him from his four years serving as auxiliary bishop, vicar general and apostolic administrator in the Archdiocese of Indianapolis from 2011 through 2014. Then came two memorable moments especially touched with heart and humor. 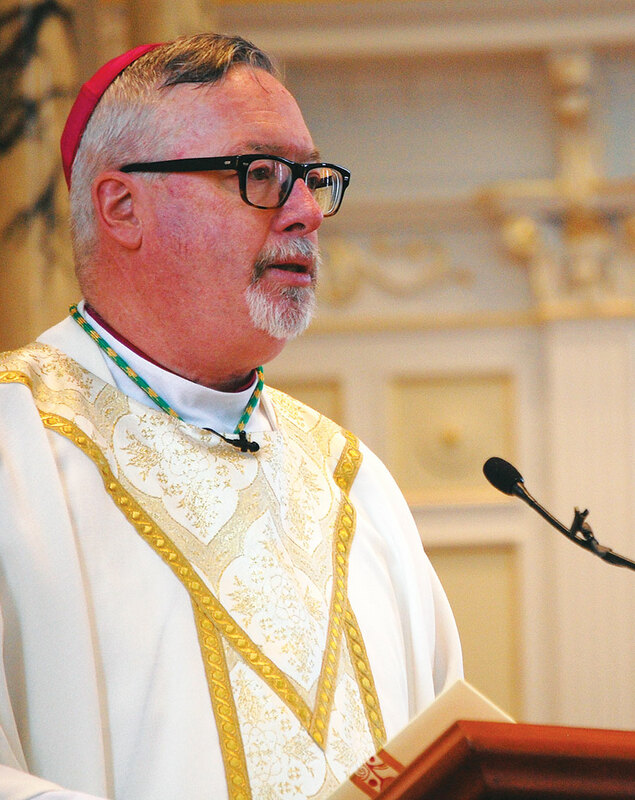 Bishop Coyne shared that moment in a conversation with The Criterion during his return to Indianapolis for the national conference of U.S. bishops in mid-June. He also talked about being back home in his native New England, ministering as a bishop in the most “unchurched” state in the country, his role as the chairman of the committee on communications for the U.S. Conference of Catholic Bishops, and the lessons he learned while serving in the Archdiocese of Indianapolis. Here is an edited version of that conversation. Q. What has it been like for you to be back in your native New England to serve the Church there? Q. At the time you became bishop of Burlington, Vermont was considered the most “unchurched” state in the country. Have you been able to see progress in bringing people to the Church, and what has been your approach in trying to achieve positive change? A. “I haven’t seen a lot of progress in terms of numbers, but we are seeing some progress in terms of environment and culturally receptivity to the idea of the Catholic Church having a place at the table in the general culture of Vermont. “From the first day I got there to now—2 1/2 years later—we’ve tried to be part of the ‘Greater Common Good’ project. Vermont has the highest proportion of not-for-profits per population of any state in the country. So there’s a lot of goodwill there. We’ve been connecting with non-Christian groups, but groups that are doing things. Rather than build our own homeless shelter, the Catholic Church is connecting with people who are doing that. Q. Social media is a big approach for you. You write a blog, you’re on Facebook, you use Twitter. Talk about the importance of the use of social media to reach people about faith. A. “It’s a continuation of a lot of things I started when I was here in Indianapolis. Most people today are unplugging from the old ways of doing things. Most people don’t have hardline phones in their homes anymore. Most people are unplugging from cable. They’re becoming more and more connected with tablets and iPhones. So if that’s the way most people are communicating, that’s where we need to be. “You learn about strategies in the digital media. Video messaging is very important, nothing more than a minute long. Short, pithy messages that are positive and attractive. There’s a lot of anger out there. A lot of hurtful things being said. So just constantly try to maintain a very positive image. And try to bring more goodness into digital media and the culture. Q. What are the main messages you’re trying to share through the committee on communications for the USCCB? “The idea of a revealed religion like Catholicism is something that people really don’t understand in many ways. So we can’t count on the old ways of doing things to work. So we’re working more and more to shift into a missionary approach, where we’re approaching a culture that is a lot of ways post-Christian. And you can’t make assumptions that people know you. You have to do correctives. Q. When you look back on your four years in the Archdiocese of Indianapolis, how has that experience helped you in your two years as bishop of Burlington? A. “When I came here to work with Archbishop [Emeritus Daniel M.] Buechlein, I encountered an archdiocese that was strong and healthy and in a good place in a lot of ways. The years that he had been here as archbishop, he really set a strong foundation for the next guy coming in. Then unfortunately, he had that severe stroke that debilitated him so he couldn’t serve as archbishop anymore. “But then being named administrator for 14 months, or something like that, allowed me to learn at a place that was a good archdiocese, that was very healthy, that had good practices in place, that had a lot of good resources, and a very healthy presbyterate and lay folk. So I came away from this archdiocese with a lot of good learning.